Nigeria Customs Service (NCS) is recruiting massively for suitably qualified candidates to fill the following Superintendent, Inspector and Assistant Cadres: - Click to read more..
Uber is looking for Driver Partners in Lagos! Got a car? Turn it into a money machine. Work on your schedule and help riders get around Lagos. It's easy to get started! Signup today. - Click to read more.. 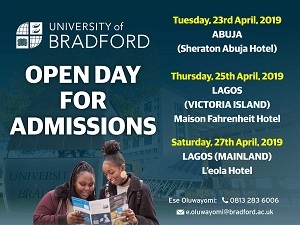 The UKEAS Study World Exhibition is here, a bi-annual overseas study fair organized by the United Kingdom Education Advisory Services, UKEAS Nigeria. So, if you're one of those dreaming of studying in the UK, USA, CANADA, CHINA, GERMANY, AUSTRALIA, MALAYSIA and many other dream study destinations, Well, time to smile! Join over 70 foreign universities and colleges at the UKEAS STUDY WORLD EXHIBITION and be part of thousands of beneficiaries of free and efficient counseling, scholarship opportunities, career and job mentorship abroad, study visa guidance and lots more! - Click to read more..
Nigeria Customs Service (NCS) Recruitment Application Guidelines - In her efforts to make the application easier for candidates, team HotNigerianJobs have detailed a step-by-step application process for a successful application in the ongoing Nigeria Customs Service recruitment exercise. - Click to read more..
BitPesa Nigeria is currently recruiting suitably qualified candidates to fill the following positions: - Click to read more..
Bolt Nigeria (Formerly Taxify), one of the fastest growing ridesharing apps in the world is urgently recruiting to fill the following positions: - Click to read more..
Viva Cinemas is currently recruiting suitably qualified candidates to fill the following vacant positions: - Click to read more..
MKOBO Microfinance Bank, a fully licensed MFB by the Central Bank of Nigeria (CBN), is recruiting suitably qualified candidates to fill the following positions: - Click to read more..
Plateau State Polytechnic, Barkin Ladi is recruiting massively for suitably qualified candidates to fill the following academic and non-academic positions: - Click to read more..
UAC of Nigeria Plc is currently recruiting suitably qualified candidates to fill the following positions: - Click to read more..
Rainoil Limited is currently recruiting suitably qualified candidates to fill the following entry-level & experienced positions: - Click to read more..
Nigeria LNG Limited (NLNG) invites applications from suitable qualified candidates for the following Post Primary, Undergraduate and Postgraduate Scholarship Schemes: - Click to read more..
Eolyon Integrated Resources Limited is currently recruiting suitably qualified candidates to fill the following positions: - Click to read more..
PZ Cussons invites applications from suitably qualified candidate for the 2019 PZ Cussons Chemistry Challenge (PZCCC). The primary objective of the competition is to stimulate and inspire the learning of Chemistry amongst students and raise their IQ. The competition will attract prizes in the following categories: 1st Prize: N1,000,000 , 2nd Prize: N750,000, 3rd Prize: N500,000 and so many more!...Entry is FREE! - Click to read more..
Breakthrough RESEARCH is currently recruiting suitably qualified candidates to fill the following positions: - Click to read more..
Nestle Nigeria Plc invite applications from candidates for its 2019 Technical Training Programme. The training program will lead to the award of a Nestle Certificate of Participation. In addition, we will prepare trainees for City and Guilds of London Technician Awards in Engineering. - Click to read more.. The Grant Management Unit under the Lagos State Ministry of Health (LSMoH) invites applications from suitably qualified candidates to fill the following positions: - Click to read more.. Emerging Platforms is currently recruiting suitably qualified candidates to fill the following positions: - Click to read more.. Oasis Africa Consulting Limited is recruiting on behalf of its clients in various sectors to fill the following vacant positions: - Click to read more.. The British High Commission (BHC) is recruiting to fill the position of: Office Manager - NCA Joint Border Task Force Project. The position is located in Lagos State. Starting Monthly Salary: N610,536. Interested candidates should possess relevant qualification. - Click to read more.. The British High Commission (BHC) is recruiting to fill the position of: BMATT Nigeria / Driver. The position is located in Abuja. Starting Monthly Salary: 234,033 NGN. Interested candidates should possess relevant qualification with at least 3 years work experience. - Click to read more..
Weatherford Nigeria, one of the largest multinational oilfield service companies is recruiting suitably qualified candidates to fill the following positions: - Click to read more..
Netcom Africa Limited is currently recruiting suitably qualified candidates for the following positions: - Click to read more..
LandWey Investment Limited is recruiting suitably qualified candidates to fill the following positions: - Click to read more..
Prisdav Consulting is recruiting on behalf of its clients in various sectors to fill the following vacant positions: - Click to read more..
Robeck Locks Limited is currently recruiting suitably qualified candidates to fill the following positions: - Click to read more..
Greenlight Planet is currently seeking applications from suitably qualified candidates to fill the following positions: - Click to read more..
ExxonMobil is recruiting suitably qualified candidates to fill the following graduate and experienced positions: - Click to read more.. The African Development Bank Group (AfDB) is recruiting suitably qualified candidates to fill the following internship and experienced positions: - Click to read more..
ENYO Retail & Supply Limited, a customer-focused, technology-driven company in Nigeria is recruiting suitably qualified candidates to fill the following positions: - Click to read more..
Action Against Hunger | ACF-International is recruiting suitably qualified candidates to fill the following positions: - Click to read more..
KPMG Nigeria is recruiting suitably qualified candidates to fill the following positions: - Click to read more..